Home › Latest News › Battle of the Potjie Kings 2016! Though we hosted the first annual "Battle of the Potjie Kings" competition in the heart of winter, we could not have hoped for better weather! A beautiful 22 degrees with no wind made for perfect potjie-brewing weather. The smell of wood fire hung heavily in the air as teams began arriving and lighting their fires from 7:15am. By the time 1pm rolled around, our 3 judges (Ewan Strydom - co-host of the Expresso Show on SABC 3, John Grundlingh - winner of Ultimate Braai Master 2015 and Trevor Dilgee - Principal of Merrydale Primary School in Mitchells Plain) were hungry and ready to crown a champion! Starting off at the Lady Bikers SA table, our panel of experts were treated to some of the best potjiekos that South Africa has to offer, with teams pulling out all the stops to gain favour in the presentation category. The other categories that the teams were critiqued on were: aroma, taste and texture. At 2:30pm, everyone gathered indoors for the announcement of which team would be taking the trophy home... Coming in at 3rd place was the Tyger Valley H.O.G.® Chapter with the Breede River H.O.G. Chapter coming in at second place. 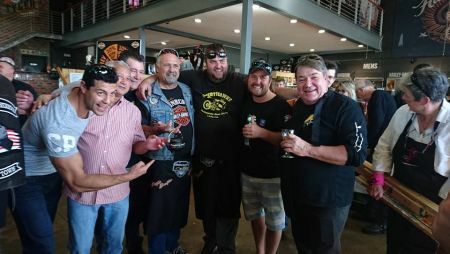 The well-deserved win of 1st place went to the Harley-Davidson Club of Cape Town, who went as far as to inject their meat beforehand! Thank you to our amazing judges for loaning us their expertise, Sam & Calla for the lovely music, Willowbridge Lifestyle Centre for loaning us extra tables and SM Art for the painting of the mini potjie trophy! A massive thank-you to the 10 teams that competed and everyone that came through to join in the fun!